Wasserman and Taylor described in 1966 that the major effect of vitamin D on chick intestine, besides the increase of calcium absorption, was the synthesis of a 28,000 Da protein. This protein was shown to bind calcium, and was named vitamin D-dependent calcium-binding protein or D-CaBP. A protein of 10,000 Da, similarly induced by vitamin D, was found in the intestine of rat and other mammals (Kallfeltz et al., 1967). 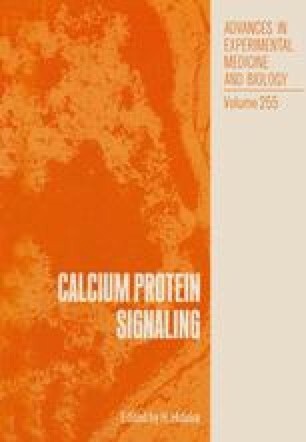 No crossimmunoreactivity could be detected between these 28,000 and 10,000 Da calciumbinding proteins and this latter protein (ICaBP) will not be discussed further in this paper. The 28,000 Da protein was described by immunochemical methods in a variety of organs, mainly the distal convoluted tubule of the kidney (Taylor and Wasserman, 1967), the pancreas islets (Christakos et al., 1979) and the brain (Taylor, 1974), both in the chick and the rat. It was found later that D-CaBP was actually not dependent upon vitamin D in its brain location (Taylor, 1974, Thomasset et al., 1982). For this reason, the protein was renamed Calbindin.